Only Pakistan can beat India when it comes to melodrama at the end of a disappointing series/tournament! Face it, India was easily one of the weakest teams in the tournament – on a helpful pitch – and this was on display for everyone to see. A little bit of bounce, and our batsmen were half out before they even reached the batting crease. Such is the monkey they have been carrying on their shoulders when it comes to short pitched bowling. Agreed, everyone has weaknesses and one needs to learn from mistakes and come back stronger. But then this monkey is no stranger to the Indian cricket team! The really saddening part of the story is that this same monkey was carried all the way to India after being shown the door at the 2009 T20 WC in South Africa! Exactly the same issues – our guys found the short balls too hot to handle, there too. Where was the introspection, and where was that effort? Mr. Gavaskar has called for the entire team to attend practice sessions at the NCA, Bangalore to correct their techniques. Good call, but then are we not a year too late? It was quite sad to see flat-pitch heavyweights like Raina and Gambhir hopping like rabbits to medium pacers like Bravo and Sammy! I can understand Nannes and Tait doing the same to top batsmen all over the world, but then this is too much! Raina tried to hook his way out of trouble but hardly succeeded in getting the ball beyond the 30 yard circle! In fact, the way he got out against Australia would have almost been the most comical ‘played-on/bowled’ dismissal had the skier fallen right onto his stumps :P Thankfully, Clarke saved Raina the blushes by taking the catch before all this could happen! Gambhir tried to duck, sway, move, run, hide from the bouncers but time ran out on him and ultimately he gave the wicketkeeper something everyone had been expecting since his innings started – a simple catch. Coming to Yusuf Pathan, I think he is going to be royally found out by all the decent bowlers around the world. He is a dangerous batsman only when the opposition has atleast 4 bowlers who have no brains. Very limited range of shots, and unless you oblige by strictly bowing in those few hit-me areas, do not worry he will not score off your bowling.. Gentleman, I say! People like Glen McGrath would have dismissed him 7 times in 6 deliveries. There are huge calls for Dhoni’s head.. Na na, not bouncers this time. There are some people calling for a change of captaincy, which I think is ridiculous! There is no doubt that by far he is the best that we have. The team that went to West Indies was also probably the best set of cricketers we have in India. No complaints about that. It was just the lack of preparation that was appalling. Dhoni is a good leader, and we must show faith in his abilities. I would love to ask people who want a change, who their replacement would be? There is no one! If someone like Yuvraj Singh becomes the captain, people will stop following the game. What was he doing in the West Indies? It looked more like a vacation visit for Yuvi, after a hard 45 days stint at the IPL! Agony is that he was one of the biggest flops at the IPL too. He really looks like someone who needs the ‘Re-vital’ pill (that he endorses), more than anybody else :) M Vijay left half his shots in Chennai while leaving... He is a class batsman with a wide range of shots but somehow he was too much in love with his hoicked sixes over mid-wicket that he forgot the rest of his shots. He got enough opportunities, and failed to impress! Rohit Sharma is a perfect example of someone who does just enough to retain his place in the team, but hardly does anything at the crucial moments in matches for India! I can barely recollect match winning knocks by Rohit for India. Again, immensely talented, but his head is not on his shoulders, it’s somewhere else. 2) This was shot right from our terrace! There was this branch which was all but withered away.. Out of nowhere this green shoot had managed to survive the worst and yet emerge from the brink! I really thought this would be the best pic to visualize the theme i was given.. Sad enough, nobody agreed... Heheh..
3) A bit of a motivational caption, I must admit.. Fuels positive thought and the vigor that's required to overcome any slump, economic or not :D Guess I was the one who needed it the most, after the results were announced .. lol.. It was not the prize or anything of the sort I was looking for, it was just the satisfaction I pursued... Eventually I ended losing whatever little satisfaction I had :P Next time there is a photo competition in college, I would be greatly motivated to click the judge's photo and mail in my application :D Atleast I would save myself the guilt of not having tried my best :D All said and done, I was not as unhappy as I might have sounded in this post.. I was more pricked :D And hence the satire ... Aaal izz (in the) well... :D Folks, next time around before choosing the photos you want to send for a competition, spend more time choosing the compeition you would like to send it to :D Smile now! It Doesn't Take Much ! There have been a few things in the recent past that has made me sit back and realize that it doesnt take much to entertain, captivate and grab the world's attention.. Sometimes we try too hard, eventually leaving behind who we are in our quest for greatness.. Yeah, it works from time to time but then most of the times its the simple yet creative things that really work. I have really been captivated by the latest Tata Docomo Ad. Its a piece of brilliance. Especially the latest ad, shot in the train with everyone ending up humming the Docomo tune, its just awesome! I couldnt manage to find that specific video on Youtube, but then I found this which has that mesmerizing tune. A little attention to detail and you will realize that the music grabs your attention though there are hardly any instruments in it. Just the way it clings on to your lips and makes you feel entranced, is a thing of joy isnt it? I so love it.. This is a video clipping from the 'Britain's got Talent' show. Amidst all the exquisite, highly talented and professional artists - this father and son pair rock the stage with their simple yet extremely cute dance performance! Their expressions, the lil guy's air of confidence in his walk, their chemistry, it all just adds to the whole performance. The two of them have weaved magic with literally nothing but happiness, energy and emotions. They have made a crowd of over a thousand, stand up and applaud their performance genuinely. Trust me, its an honor to be able to entertain. To be able to face a crowd, and do your thing with pride - takes courage and attitude. These 2 chaps have not only entertained, but also lightened the hearts of millions! I look upto to such people with respect and admiration! The post finally trickles along, after another long hiatus! Its been that sort of a month actually. Lots of things on my mind, but only few successfully made it to the execution phase. Heheh, life's like that huh? Yeah, I heard u say that.. Anyway, coming to things at hand, I was tagged by Satish. The tag goes like this - I need to list down 8 random facts about meself.. And then, I tag 5 other people - which I will not be doing cos I am pretty sure no one visits these days, for good reasons mind you :P lol..
1) I am a very very positive person. You'll rarely (read never) find me without hope :) You might see me down, and you might see me upset, but you can bet your life that the last line I speak to you will be a positive, optimistic one. If not, check again, you might not be talkin to me :) I will never lose hope as long as a sniff of life still remains within.. I strongly believe that hope drives the world..
2) Mad about music. One day in my life without music would probably be the day I die, and that too only if I die early in the morning.. lol.. Or else, some amount of music wud have found its way into my life, somehow! Either thru the TV, my MP3 player, the radio, my phone or... Love music beyond description. I can get lost in my own world listening to music. 6) If I appear to be very silent, it means I dont know you really well. Simple as that. I am not someone who can jus be really close friends over night. But once I get to know someone, there is no looking back. I love to make friends! Finally the curtains were drawn, on one of the worst World Cups ever! A sad end to a sad story actually. Being an avid cricket fan, I was really disappointed at the turn of events. What was dished out on the field, was pretty ordinary.. And off the field, it was pathetic! I must give credit to the Australians though. They played some fantastic cricket all through and they were the rightful winners. (I was supporting Sri Lanka though he he) I wonder from where they got the drive, to play at such a high level in a poorly organized tournament! The tournament did not start off well, with India and Pakistan both being packed off in the first round itself. India - thanks to some indifferent cricket, and Pakistan - due to its usual extremes when it comes to playing. The Pakistanis either play like possessed people, or they hardly play like 'people' at all! Add these to Woolmer's murder, ticket prices being exorbitant, no musical instruments allowed into the grounds (in the Windies?? U gotta be kiddin me! ), sub standard cricket, a world cup spanning whole of 50 days.. And you'll realize what I mean! Anyway, lets not brag about the tournament, its over now. That was not what this post was meant for! It was the 21st of April, that triggered this post of mine. 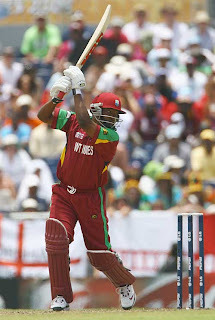 If you're still in the dark, it was Brian 'Genius' Charles Lara's adieu to cricket! No prizes for guessing where this ball ended up!!! I have been a Lara fan ever since I started watching cricket! Which would approx be 12 years back.. No doubt, he is still one of the most controversial players around but still the moment he stepped foot onto the cricket field, the whole world chose to ignore all of that! Thats the influence this man had on the game. His batting was pure fluent poetry in motion, of the highest honor that too! He was part of an era where he battled for the title as "Worlds Best batsman", with our own Sachin Tendulkar! The debate still goes on, and I think its fair to say that its a 50-50 call. Both were brilliant in their own ways! My heart says Sachin, but had I not been an Indian, I have a feeling that I would have vouched for Brian Lara! Some of feats can never be matched by Sachin, no doubt. His temperament was a notch higher, and Lara could bat on and on and on! Scores of 400 and 501 are testimony to this fact :) He revived a sagging West Indian cricket team, and almost single handedly made the world stand up and notice the Windies cricket team! He was more of a match winner, than Sachin was. Sachin would probably edge Lara in consistency (90's), elegance and grace. However, Style - was all Lara's! His high batlift, and that lovely bat swinging down, belting the ball, and landing the bat behind his back - wow what a sight to behold! All said n done, the glorious chapter has come to an end. We will not see that bat lift so high again! This very thought bought a tear to my eye, and thats when I was convinced that I should start blogging again. His final match was an emotional one, things dint quite go his way that match but that dint change anything one bit! He was given a rousing send off by the crowd, and tears were lining up in his eyes, for all to see! What a sad moment :( The Genius might have retired, but his legend remains forever! He'd given some of the best memories to cricket, and he'd never be forgotten! The 'Bundle' Of Life !!! Technology has reached dizzying heights, software has developed way beyond our wildest imaginations, travel and living has advanced like crazy and the list goes onn.. 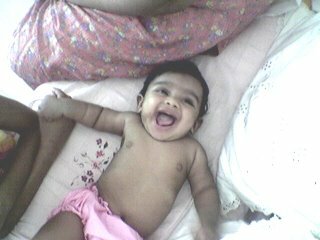 But the ONE thing that has always fascinated me the most, has been the small bundles of life, babies!! Yes, even a peasants family can bring into the world, the same angel that any millionaire could have! This miracle of God is something way beyond technology, money, knowledge, power, status, religion, nationality - say what you want - its still way beyond it! My passion for the little ones has driven me to post yet again. This time ofcourse with some snaps to support my stand... The pics that you will be seeing on this post, were all taken on my mobile phone! Mobile photography is something that I am crazy about! My friends would know best about this, lol. The way they get irritated when I start clicking away to glory, taking snaps of trivial things too! :) My mobile is not THE latest one in the market, so please adjust with the picture quality n stuff lol. Instead try to imbibe the sweetness from the expressions and the implicit beauty of the pics! Thats Mariam, cozy as ever. Thats what I call 'deep sleep'! 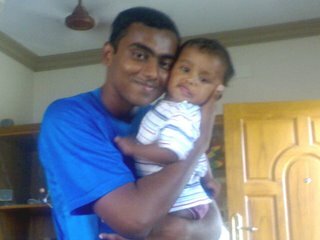 Okay, these pics were taken when I was at my native place, Cochin! 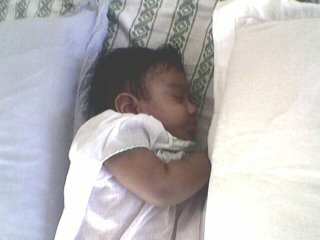 The sleeping princess is my niece 'Mariam'. Isnt she such a doll? Wow I jus love this snap. The 2 pillows are kept on both her sides, to prevent her from rolling and falling off the bed :) And to imagine that the pillows are bigger than the child! So cute.. 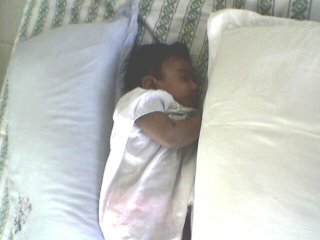 The way the baby curled up inbetween the pillows was a really adorable sight, and I just could not resist clicking! Those pillows which would otherwise seem so insignificant to us when we use it everynight, now seemed to have that magically cute thing associated to it, didnt it? The million dollar smile! I would'nt mind travelling miles to see this one! Amma doing what she does best! Doesnt the expression on the child's face say it all? So cute!! 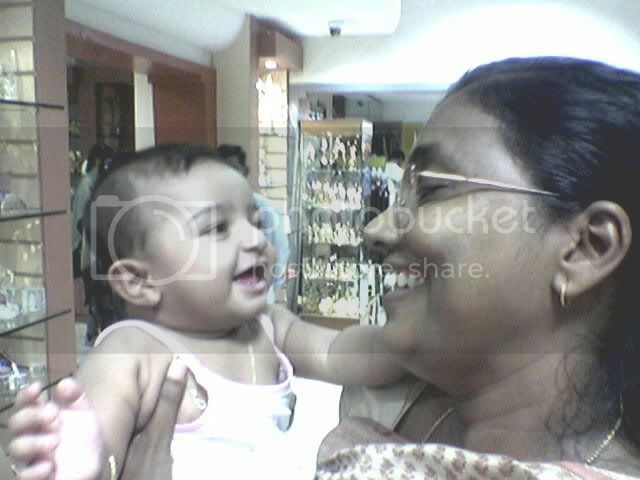 Thats my mom with one of her old student's son. Man, does she have her way of handling babies! I guess I got this attraction towards babies partly because of her. She can make ANY baby stop crying, and she manages to put them to sleep too (Not by talking!)... She is just awesome with a baby in her hand. Probably I was totally mesmerised by the way she handled them..
She is not called a 'baby' just cos of her age, or else she is every bit one!! Lowe this snap..
For a change, this time its not a 'baby' as such, but she's my grandpa's sister. 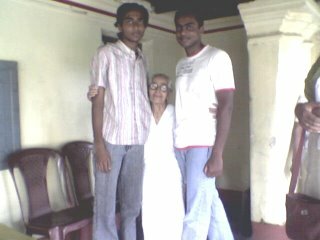 One of the sweetest 80 year olds, made to look like a small babbiiee, inbetween two 'tall' brothers!! lol... Yeah dats me and my bro flanking her on both sides! Women might not get much mroe safer than that, lol.. Jus kidding.. But hey in this pic, pls dont think she is sitting or kneeling.. She is very much standing, and there are not photoshop tricks here! :) Have to mention again, she is a reallly sweet granny. She lovvvves usss sooo muchhh!!! That's me holding Sara! (I've put her to sleep, note da point..) lol..
Back to the real 'babies'. Thats my cousins daughter, 'Sara' and me, in the pic above. 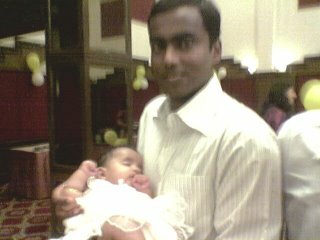 It was her baptism ceremony, and thats why yours truly was in full formals and all.. lol.. The place - Days Inn Shaan, Chennai. The actual 'baptism' ceremony was just about the only time when that child was not in my arms, lol... That too the priest insisted that the baby should be with him, for that 15 mins when they pour holy water on the child... :) Rest of the time, I had the privilege of 'handling' her..
Hope you people did not mind the HUGE post :) It was a topic I truly loved, from within my heart! I had a tough time trying to stop my hands from flying all over the keyboard. The words jus kept (keep) coming and coming and... . There are still lots more snaps with babies! Probably I'll put them up in another post, cos this one is gettin jus tooo big! lol.. Like I always say, that feeling when a 'bundle of life' sleeps innocently on your shoulders - is a feeling beyond compare! Nothing comes even close, in comparison! Seeya around! Welcome to my little space on the web! This is where I give vent to all those thoughts in my head, be it my life, music, sports whatever the topic :-) I love to pen down stuff, my feelings, my views etc. Writing, happens to be one of my passions! Happy reading, or rather.. Happy dozing.. hehe! Posts That Have Gone By !